The Supremes will consider three criminal cases in oral arguments scheduled for January 12 and 13. The effect of the decisions are not broad, but the cases illustrate the Court’s responsibility to keep the criminal justice system as construed by the lower courts consistent, rational, and based on precedent. Those who are not part of the criminal justice system are often surprised when they learn that Double Jeopardy does not prevent separate sovereigns from launching separate prosecutions for the same conduct by a defendant. The most common example is when a defendant faces charges from a single course of conduct in both state and federal court. An acquittal or conviction in one jurisdiction does not preclude charges in another since each has the right to define and punish offenses committed in its jurisdiction. Puerto Rico v. Sanchez Valle will decide whether that territory and the federal government are separate sovereigns permitting dual prosecutions. First, a bit of history. The United States obtained the island from Spain after the Spanish American War in 1898. It was a “splendid little war” which made the U.S. a colonial power and made Teddy Roosevelt the President. What could establish his executive qualifications better than the ability to lead a bunch of cowboys and polo players up San Juan Hill? After the treaty in 1899 Congress established a civil government there with the Governor and the Supreme Court of Puerto Rico appointed by the President and any laws passed by the legislature submitted to Congress for potential annulment. In 1950 Congress offered Puerto Rico a “compact” of self-government. The islanders passed a Constitution in 1952, which was approved by Congress and President Truman. The Constitution removed the oversight powers of the President and the United States Congress, and Puerto Rico was empowered to make its own criminal laws. Sanchez Valle was charged with illegal sale of firearms by Puerto Rican authorities. While the case was pending, however, he pled guilty to the federal version of the same offense and was sentenced to 5 months in prison, a much lighter sentence than the one he faced by the territorial charges. The trial court dismissed those latter charges as violating Double Jeopardy. The Puerto Rican Supreme Court agreed, holding that Puerto Rico was not a separate sovereign from the United States government. The case comes down to whether the source of Puerto Rico’s authority to pass and enforce criminal laws is the 1952 Constitution or the ratification of this Constitution by Congress. Is Puerto Rico a sovereign part of the federal system in the same sense as states or an Indian tribe or is there enough of a vestige of colonialism to make the federal government the ultimate source of public power? Prediction: The days of Yankee Imperialism are gone. The will of the Puerto Rican people are sovereign, and if they want to initiate a dual prosecution in addition to the Feds they should be able to do so. The Court will reverse the Puerto Rico Supreme Court and enable the territorial prosecutors to take a second whack at Sanchez Valle if they choose to. In the second January criminal case to be argued, Molina v. Martinez, the petitioner was a Mexican citizen who entered the United States after he had been previously deported. After pleading guilty, the probation officer recommended a Sentencing Guidelines Criminal History category of VI with a range of 77-96 months, the judge accepted it without defense objection, and the defendant was sentenced to 77 months, the bottom of the guideline range. On appeal the defendant realized that the Criminal History category should have been V since his prior convictions were sentenced on the same day and therefore should have been counted as a single offense rather than as multiple offenses. The correct guideline range should have been 70-87 months. The problem is that his failure to object means that, under the plain error rule of Rule 52b, he has to show that the error affected his substantial rights, that is, affected the outcome of the sentence that the judge would have imposed. Since the sentence imposed fits within both the correct and incorrect guideline ranges, the government argues that no plain error has been established. There has been no showing that a different sentence would have been imposed. The defendant argues that the error should be presumed prejudicial. He should not have to establish by the record that the sentence would have been different. Where the “natural effect” of the error is likely to affect the outcome, he argues that he has met the rebuttable presumption test and the case should be remanded for re-sentencing. The Fifth Circuit Court of Appeals rejected this claim since there had been no actual proof of a likely different outcome. 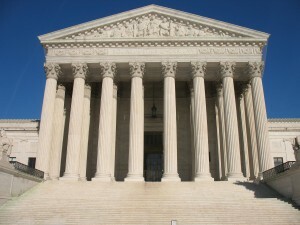 Other Circuits have held to the contrary and allowed a presumption of error to satisfy Rule 52b in the case of incorrect guidelines, thus creating a split for the Supreme Court to resolve. Prediction: The whole purpose of the Sentencing Guidelines is to affect the judge’s decision on the sentence to impose. A defendant should be entitled to correct guidelines and not be precluded from an appeal by his failure to object. As one judge remarked, the guidelines are “absurdly complex” so this failure should not prevent the trial judge from making a sentencing decision based on the correct guideline range. The Court should reverse the case and send it back for re-sentencing. The third case, Duncan v. Owens, is a habeas case under Section 2254, which permits relief from a state conviction if the error was contrary to Supreme Court precedent. The defendant was convicted of murder after a bench trial. The trial judge found that he had beaten a seventeen year old to death with a baseball bat as the victim was riding his bike outside of a liquor store. The victim was found to possess numerous crack cocaine packages. In announcing his verdict, the trial judge mentioned that he believed the defendant’s motive had been because the victim was a crack dealer and that was the reason the defendant wanted to “knock him off.” There was no specific evidence to point to this motive, and so the defendant argued then and now that the judge’s findings were based on evidence not produced at trial. The state courts rejected the argument and found the comments to be harmless speculation. The Seventh Circuit agreed with this argument since the defendant had a right to have his guilt determined strictly by the evidence. Prediction: The Supreme Court will reverse the 7th Circuit. The real issue of this trial was the identification of the defendant as the killer not the reason for his conduct. The comments about why he did it were brief and just the judge’s speculation as to the motive. Proof of motive is not required, and the judge’s inference was not so inconsistent with the evidence on the elements of the crime as to indicate that he made his decision as finder of fact on matters outside of the evidence. Reverse, reverse, reverse. Of course, as usual I could be wrong. These will not be unanimous decisions so it is likely that the usual swing votes will decide whether these predictions are correct. Posted: 12/20/15 at 10:43 PM under Uncategorized.